More than 4,000 pieces of Faberge's work on display in new, private museum backed by Viktor Vekselberg. Bejeweled Easter eggs once owned by the Russian royal family and a private collection of Renoir paintings are part of more than 4,000 pieces of art displayed at a new St. Petersburg museum founded by the well-known Russian billionaire Viktor Vekselberg. A private museum opened this month in the renovated Shuvalov Palace in St. Petersburg. This palace, which is situated on the Fontanka River Embankment, was in a dilapidated state. The unique historical interiors were restored at a cost of 1.2 billion rubles before the opening of the museum. Prime Minister Dmitry Medvedev attended the opening ceremonies. Jeweler Peter Carl Faberge, the founder of the family firm and a dynasty of jewelry craftsmen, became famous for creating a series of precious Easter Eggs, most of which were crafted at the special request of the Russian Imperial Family. Of the only 71 documented eggs, 52 were produced for the Romanov Dynasty. The whereabouts of some of the eggs is not known. The bulk of this exhibition is from the private collection of the Link of Times Cultural Historical Foundation, which is owned by Vekselberg. The collection contains about 4,000 works of decorative art, including a collection of Faberge Easter Eggs, purchased in 2004 from the heirs of the American tycoon Malcolm Forbes. The Link of Times Foundation added to the collection over the course of the next nine years. 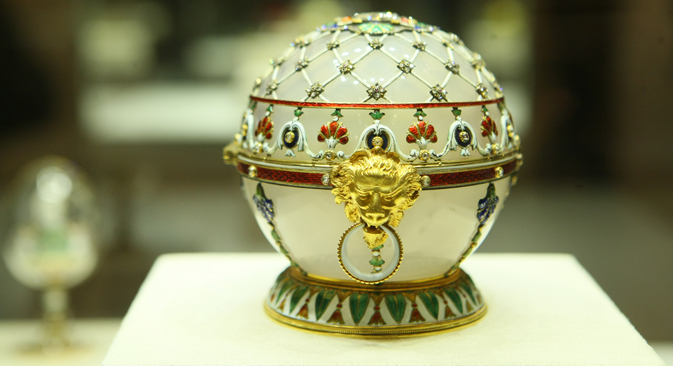 The centerpiece of the exhibition is the Imperial Easter Eggs Collection, which includes the first egg made by Faberge. Tsar Alexander III ordered the egg for his wife Maria Fyodorovna in 1885. Rare paintings and other art objects from the Vekselberg's personal collection are also on display. “We really wanted to create a museum associated with the history of Russia in the 18th to early 20th centuries. One of the symbols of this period – Carl Faberge, rose to the top of artistic jewelry craftsmanship,” Vekselberg said. Can the jewelry industry improve Russia's image? In addition to the Faberge collection, the exhibition includes works by such famous masters of artistic jewelry as Ivan Khlebnikov, Pavel Ovchinnikov and Ignatius Sazikov. The exhibition also displays paintings by famous Russian and European artists – Vladimir Makovsky, Ivan Aivazovsky, Karl Briullov, Konstantin Korovin, and Pierre-Auguste Renoir. The museum in the future will host temporary exhibitions. “Now we are negotiating partnership agreements with the Pushkin Museum and the Tretyakov Gallery,” Vekselberg said. Medvedev said the opening ceremony was his first chance to see the complete collection. “I read about it, I heard about it, but I had not seen it before,” he said. Looking over the electronic stand installed in the museum hall, where one can learn about the history of the works by Faberge, Medvedev recommended that an English version of the descriptions should be provided. The creation of the museum, including the formation of the collection and restoration of the palace and exhibits, was done with private funds from the Link of Times Foundation. The museum will open to the public in early December. Based on materials from RIA Novosti, Lenta.ru, Gazeta.ru and Moskovsky Komsomolets.